This offer from Mid-Hudson Cable showed up today in a bank statement from The Bank of Greene County. Mid-Hudson always gets my attention but almost never for good reasons. This ad is a continuation of their finger in your eye approach to customers. Note that it offers “DOUBLE” and “TRIPLE” your speed for Internet service without ever mentioning what it is that they are doubling or tripling. This is simply a further progression in making it hard to find out what exactly you are paying for or even what it is they are promising to provide. If you pop over to their website you can find this (my screen grab from today with added red arrow), that says that the regular residential service package provides “5 meg”. From other advertising I know that this is likely to mean 5 MegaBits/second (MB/sec) a meaningful identifier. Here is the rub. In almost two years of experience with Mid-Hudson I have never experienced this level of service nor the 10 MB/s for which I am now paying in an effort to get my service level up to something useful. In fact, after hundreds of measurements over the last year, I can tell you with some assurance that “5 meg” really means 3.8 meg. And, if you use the Internet services during the peak hours of late afternoon and into the evening, the service level is significantly lower. The non-exclusive contract between the town and Mid-Hudson is for “video” service only, meaning for cable television and not internet service, explained Pat Johnson, senior municipal consultant with the state Public Service Commission (PSC). So this appears to leave us in a situation in which Mid-Hudson has a de facto monopoly on high speed internet service in the county (Verizon only offers DSL service which is, for technological reasons, limited to below 1 MB/sec service levels) without any regulatory or contractual leverage. What Planet is the Times Orbiting? Today’s New York Times editorial page included a piece titled “How Fast Is Your Broadband?“. It provides a reasonable review of the sad performance of the Internet service providers in the US. It is widely known that Internet service providers like Comcast, Time-Warner and locally Mid-Hudson Cable chronically provide significantly less than their advertising claims. 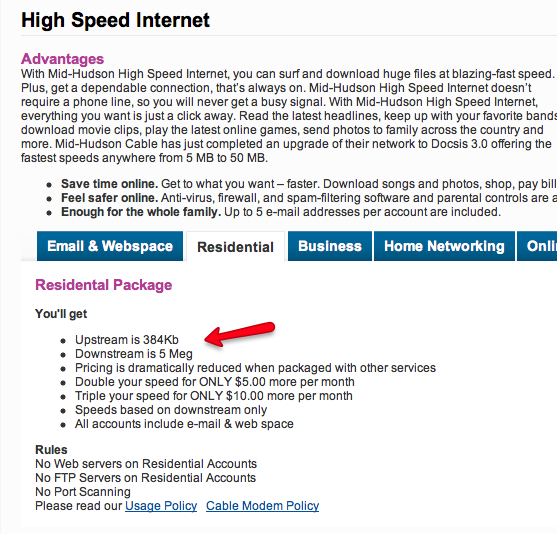 Here in Hudson, NY Mid-Hudson claims “blazing speeds” of 5 MB/sec (download). Repeated measurements, now numbering over 280 in the last six months prove that they provide speeds 30% less than this mark. Service technicians from M-H have acknowledged that this is the typical service they provide. Worse is that the latency frequently reaches 2 seconds instead of being under the 100 milliseconds that is commonly accepted as OK latency on the Internet.. This means that after your click your mouse on a link in a browser, you can literally count “1 Mississippi 2 Mississippi” before you get any response to your query. This latency disables common communications tools like VOIP telephone services and audio and video services via Skype or Google.